In mid-September, Brian Keith Wallen toured through Colorado, and as has become our custom, we played a few shows together. We had a blast performing as a duo and sharing some of our solo work at Ziggie’s and The Wild Goose Meeting House. We compounded the fun with an impromptu recording session and the release of a seven-song digital EP, Mountain Roads. Brian and I each had a couple of small recording projects to work on. Brian has a new CD project in the works, and he had a new song that he wanted me to play on as part of that project. I had developed an arrangement of Nearer My God to Thee that I wanted to record for DisciplesNet Church. To encourage me to record again, Deb had given me a gift of three hours at Sawtelle Studio. Sawtelle Studio is part of Swallow Hill Music in Denver. Brian and I didn’t have anything booked for Saturday evening, and so we went straight from our show at Tenn Street Coffee to Swallow Hill. Brian Hunter, the chief engineer at Sawtelle, set us up, and we recorded each of our projects. Brian added backing guitar and a great solo to Nearer My God to Thee, and I thumbpicked a solo and sang harmony vocals on his new song, Grateful Heart. We made two takes of each song. When we had finished, we still had about an hour and a half left. We forged ahead, recording some of our favorites from our set list. When all was said and done, we had recorded seven songs, including Brian’s mix time, in three hours. Add one more hour for mastering, and we went from zero to seven radio-ready tracks in four hours. What made this session different? For starters, Brian and I have fun playing music together, and we had been playing these songs together in the living room and in our live shows. We were going for a “live in studio” sound, and so the recording did not require a lot of editing and overdubs. So after playing live that morning a quick break for lunch, we carried that energy into the studio. One other thing makes this amazing. We did not go to Sawtelle intending to produce and release an EP. Mountain Roads is a totally impromptu album. Without planning on it, we suddenly had seven tracks, and we were so pleased with the result that we wanted to share. Five days after being in the studio, using four hours of studio time, we had released an album. 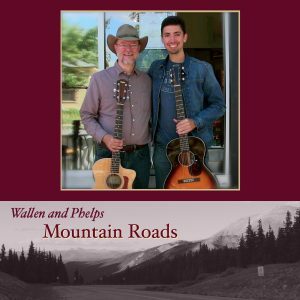 Mountain Roads reflects the joy that Brian and I share in playing music. The album demonstrates what can happen when joy meets up with preparation in an impromptu spirit. We may never record another album this way, but we can look at this release and see how friendship and partnership brought us to this point. We can only imagine where friendship and partnership might take us from here. The morning of our session, Brian and I had played at one of my favorite venues, the patio at Tenn Street Coffee and Books in Denver. I think this video clip shows just how much fun we were having.